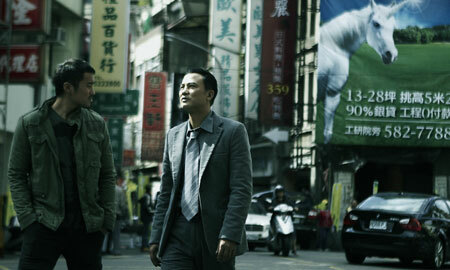 Joseph Chang and Simon Yam take on the politicians in Ballistic. The Skinny: Entertaining yet underwhelming cop thriller loosely based on the 2004 assassination attempt on Taiwan president Chen Shui-Bian. Lawrence Lau gets some mileage out of his sensationalistic premise, but overall Ballistic could have been a lot better. by Kozo: If you follow Taiwan politics at all, then you should know that they're a mess. And if you don't follow them, then you now have a sensationalized primer to give you a heads-up. Lawrence Lau directs Ballistic, a crime thriller that uses the turbulent world of Taiwanese politics to tell a riveting story of cops, corruption, and how righteousness still has value in this grey-shaded world. Or maybe that's just what it wants to be. Actually, Ballistic is more plodding than powerful, and its themes don't really run that deep, but the film manages both interest and entertainment value because of its crime movie trappings and sensationalistic storyline. It's questionable if the film achieves anything, but it's worth seeing nonetheless. The film opens with cop Yuchang (Joseph Chang of Eternal Summer) taking down an annoying young gangster in glorified "I'm a movie cop" style. However, his collar is negated when the shadowy higher-ups remove him from the case. What's going down? Simple: corruption and plenty of it. The gangster is the son of Pang (O Chun-Hung), a veteran gang leader who employs a Vietnamese killer named Jinshui (Gordon Lam, sporting fake bad skin to give him more street cred). Pang is in bed with senior government official Zhengbei (Chang Chu-Kuo, father of Chang Chen), who wants Pang and Jinshui to kill Taiwan's VP. But Yuchang and his stalwart boss Sun (Simon Yam) are tipped off to Jinshui's moves, and stakeout a key campaign parade in hopes of nabbing the killer. Can these incorruptible cops stop the assassination before Zhengbei and Pang make a mockery of the electoral process? No, they can't, because they have no idea how deep the corruption goes. They only think an assassination is going down - they don't know that the President's office and the gangs are colluding on the hit. Why would someone in the President's employ want the VP offed? Simple: the sympathy vote. Incumbent president Xiong (Cheng Meng-Sheng) is losing ground in the polls, and an attempt on his life would make it look like the opposing side is playing dirty, thus funneling more votes his way. Luckily, Yuchang and Sun do just enough to prevent any actual death, though both Xiong and his VP are wounded. But Xiong's injury turns out to be more severe than originally believed, leading to even more suspicions of chicanery. Is Xiong faking a worse injury? Why is it that Yuchang's superior officers finger loser Ertong (Liu Kai-Chi) instead of Jinshui for the assassination attempt? And why does this story sound familiar? Again, if you follow Taiwan politics at all, you should know where this story comes from: the controversial 2004 assassination attempt on Taiwan president Chen Shui-Bian and VP Annette Lu. Chen and Lu were shot while campaigning for the Democratic Progressive Party (DPP), but escaped with non-critical injuries. The following day they managed to narrowly win their reelection bid, but the opposing Nationalist Party, a.k.a. the Kuomintang (KMT), maintained that the attempt was manufactured to gain sympathy votes. The story of Ballistic extrapolates from that event, and even goes so far as to incorporate real footage from the 2006 "Besiege the Presidential Office" demonstration, when thousands of red-clad protestors called for Chen Shui-Bian's resignation in light of corruption charges. Factor in the film's poor depiction of the Taiwan government circa 2004, and you have what looks like a movie made by Chen Shui-Bian's numerous KMT detractors. At first glance, Ballistic seems like anti-DPP propaganda. That's really not the case. Ballistic may obviously resemble real events, but it doesn't present an actual criticism of said events, eschewing politics for more common thriller tropes. The film's fictional Taiwan president doesn't espouse the values of any known political party, and simply appears to be a corrupt and rather small man. In fashioning Ballistic's plot, the filmmakers merely took a disputed event and ran with it, concentrating more on the regular Joe cops who get drawn into a corrupt political arena then some sweeping critique of any real-life person or parties. It's possible to read a veiled point-of-view simply by the film's portrayal of the Taiwan President as a corrupt individual who would look to assassinate his own VP. However, let's give the filmmakers the benefit of the doubt, and assume that this was only intended to be movie. As a purely imaginary extrapolation on a real event, Ballistic is largely guiltless of being propaganda. However, the film doesn't fully live up to its very interesting premise. Ballistic's concentration on crime thrills is a good move, but the film has no mystery or suspense, and doesn't find greater emotions behind its details. Despite the rich background available to the filmmakers, the film doesn't reveal anything greater than the obvious notion that political corruption blows. Furthermore, the crime details seem routine, and don't truly fascinate. The film's Chinese title is likely a reference to the few scenes where the characters work with bullets, which is both a clue to the faked shooting and a key to Yuchang's investigation. However, those scenes aren't given the emphasis required to make them representative of the film. The film's English title, Ballistic, is also a reference to bullets, but carries the connotation of rip-roaring, high-impact action. Unfortunately, nothing that exciting occurs here. What does occur? A whole lot of bad circumstances, as the film's characters must deal with corruption's far-reaching, inescapable consequences. There's a lot of potential in that theme, but Ballistic curiously does not capitalize. The characters here should feel trapped, with their inability to secure justice akin to the walls closing in on them, but oddly that doesn't happen. The lack of character development is one of the issues, as none of the characters really stands out. The best performance probably belongs to Chang Chu-Kuo, who gives his corrupt politician a smarmy malevolence. Simon Yam seems out of place in Taiwan, and his obvious dubbing hurts both he and Liu Kai-Chi, who continues his string of entertaining overacted performances. Lead Joseph Chang has fine screen presence, but his character is less interesting than it should be. Secret's Alice Tzeng provides stellar eye candy in her limited supporting role. However, her portion of the film - a brief journey to Hong Kong to find the missing Ertong - lacks credibility.